WASHINGTON (CNS) — The American Friends of Chartres has launched a crowd-funding campaign in the United States to help restore and preserve a 20-foot-high 13th-century stained-glass window in the Notre-Dame de Chartres Cathedral in France. Once what is known as the Baker’s Window is restored and before it is put back in the cathedral, the window will travel to the United States for an exhibition in one of the nation’s museums known for their large collection of medieval art. Notre-Dame de Chartres, which was built more than 800 years ago, has the largest collection of 12th- and 13th-century stained-glass windows in the world. “We want to bring the beauty of the Chartres to the American people,” said Dominique Lallement, president of American Friends of Chartres, in a phone interview with Catholic News Service. She explained that bringing the stained-glass into the U.S. will be a great opportunity for many people to experience something that they may have not seen before. It will be one of the first times “that stained-glass of the 13th century will travel to the United States,” she added. Lallement said American Friends of Chartres is motivated by a the desire to preserve a world heritage that represents a lot to many people across the globe. The organization was established in 2005 to raise funds in the U.S. for the restoration and preservation of Chartres; the window project is just one part of the years-long restoration effort. 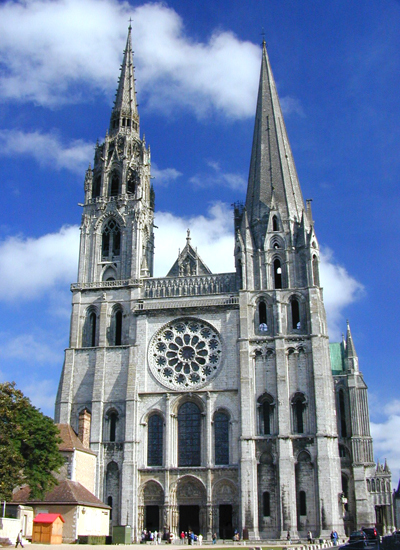 In 1979, UNESCO added the Chartres cathedral to its list of World Heritage Sites. It is considered one of the finest examples of French Gothic architecture. “The cathedral is a large picture book recounting the covenant between God and humanity, supporting Christian faith,” Bishop Michel Pansard of Chartres in a statement accompanying the announcement of the crowd-funding effort. Lallement explained how Chartres draws millions of visitors from across the world, no matter what their spiritual background or religion is. “It is a place that for building understanding and peace among people,” she told CNS. She also said Chartres symbolizes the historical and cultural bond between the French and the American people. Every year 1 million Americans are among the millions of visitors to the cathedral. “There is a very deep compelling story between Chartres and the American people,” Lallement said. She explained how the Americans saved the cathedral from destruction at the end of World War II. It was Army Col. Welborn Barton Griffith who helped save the cathedral by challenging an order to destroy it, according to a statement by French Ambassador to the U.S. Francois Delattre included in the crowd-funding announcement. American Friends of Chartres hopes to raise about $250,000 to restore the Bakers’ Window. Lallement explained that each piece of glass will be removed one at a time from lead framing. Among features of the window are its rose window, which depicts Christ enthroned; two lancets depicting St. Peter and St. James the Major; and panels showing bakers going about their timeless tasks of shaping dough and baking bread. Lallement said that she expected the window restoration to begin in the fall of 2014. She added that American Friends of Chartres has raised 20 percent of the money needed so far. Additionally, she said her organization plans to organize some cultural events related to window’s restoration in Washington, Los Angeles and New York. Editor’s Note: More information about American Friends of Chartres can be found at its website, www.friendsofchartres.org.